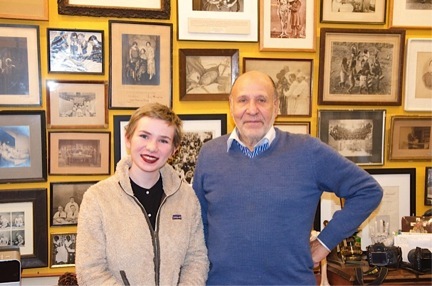 As a participant in Reed’s winter externship program, Ray Self, sophomore History major, spent eight days working in New York City at the Burns photography archive. This winter break, I spent eight days working at the Burns Archive, a photographic archive in New York City that specializes in early medical photography, in addition to having a wide range of collections covering a variety of other historical topics. The Archive has provided photographs and historical information for a number of film and television projects, most notably working on the Knick, a Cinemax series set in a hospital at the beginning of the 20th century. I had the opportunity to aid in a range of different projects during my externship. Most notably, I was able to see firsthand how the Archive organizes their image collections, and how these images are selected and prepared for publication in their series of photographic books on various historical and medical topics. Because of the immense quantity of images that the Archive possesses, I was curious to learn about the organizational systems they had in place to manage the collection. I was expecting a complex computerized database of images, and was surprised to see they utilized a very different organizational method. Boxes full of photographs were given a label related to their historical topic, and stored in a special room equipped with a digital camera for image capture. Images were organized in a way that was functional to current projects; as assignments arose, collected images related to that topic were documented via the camera and organized in a more comprehensive fashion. A large part of my duties involved organizing photographs within a particular topic by size, by content, and by photographic type. This could be a surprisingly creative task: I was instructed to choose the photographs within a topic that I saw as particularly relevant or important to the subject, and was able to create different categories of photographs within these topics as I saw fit. Supplementary texts related to the photographic topics were lent to me so I could gain a more comprehensive historical background on the material. In addition to this, exposure to the research necessary for the creation of historically accurate film and television helped me understand of the role of an archivist or librarian in the production of media. Ensuring historical accuracy is a meticulous process; seeing both the research methods and the resources utilized by the archivists will help me both as a current student and in the future, as I decide which careers I want to pursue.